Pierce looked to me to be around sixty years old. He is a couple inches taller than I am, which would make him about 6’3” or so. He has a large head and graying and thinning conventionally cut hair parted on the left side. His hair was long enough so that it curled up in the back. He is a bit hunched, and his head nestles down into his shoulders and thrusts forward. What stood out to me about his face were his large forehead and mouth. His face is unlined, his nose is straight and unremarkable, and his small ears protrude some. His eyes were blue behind the thick lenses of the conservative plastic-framed glasses he had on. That day, Pierce had on a jeans jacket over a dark blue T-shirt with a pocket in which he had what appeared to be a white index card. His faded blue jeans hung straight down in the back in the way they do with older men. He had on brown workboots. Around his waist was a pistol belt. A holstered weapon was on his right and more to the back than to the side. The weapon wasn’t visible because he had pulled his T-shirt over it. Pierce’ s basic appearance is long and lean, but when I shook hands with him I was taken by the size and strength of his hands and forearms which showed beneath his rolled-up jacket sleeves. His handshake was firm and confident. I had read that Pierce, as it was phrased, “doesn’t have a very dynamic presence.” That certainly wasn’t the impression I was getting. He had the air of somebody important and as being the kind of person who very much fills up the space they are in. “Come on in,” Pierce said, motioning with his left hand toward the building to my right. I turned and for the first time got a good look at the National Alliance headquarters building. It is two stories tall and perhaps sixty feet wide. Pierce has a Ph.D in physics, and this room is where he goes to get away from it all. One other thing on the second floor: a television set next to the back wall amid boxes of books. I believe it is the only one on the property. It turns out that Pierce and those around him are down on television, seeing it as a reality-distorting and mind-warping force in the hands of their adversaries. Pierce isn’t about to get the cable, and the only station that reaches this remote area is an NBC affiliate—barely reaches, the picture is snowy and doesn’t qualify as being in color. Pierce is a faithful watcher of the NBC evening news. As far as I know, that is the extent of his television viewing other than tapes friends and followers send him, and I don’t believe anyone around him watches television at all. I find Pierce to be an absolutely fascinating character and his story to be a whale of a tale. And besides Pierce, in the course of putting this book together I came across a number of other fascinating—which is not to say admirable—characters, among them, George Lincoln Rockwell, Robert Lloyd, Revilo P. Oliver, Francis Parker Yockey, Savitri Devi, Elizabeth Dilling, Bob Mathews, and William Gayley Simpson. This cast of characters and their world was all new to me, and I have had the treat of a terrific, real-life movie for the year and a half I have been working on this book. I found that that alone has been enough to keep me going. I’m not talking about anything authorized, that is to say, where explicitly or implicitly I have the job of fronting for you, making you look good, selling you. But at the same time, I wouldn’t be aiming to demonize you or set you up as a straw man to serve some agenda of my own. I also don’t want to play a game academics often play [I am a university professor], which is to stand above their subjects, as it were, and patronizingly critique them and make themselves look good in the process. What I do want to do is focus on the issues you raise and the ideas you affirm and your current activities within the context of the events and circumstances of your life, and to present it as objectively as I can. Whatever else comes through, I want who you are and what you are and where you have come from put out there for readers straight and true. I am not interested in exposes or inside journalism. I am interested in where this culture and society is heading and how we live our individual lives, and what you and what you represent have to do with that. Your idea is an intriguing one. I am not convinced that the things I have accomplished to date merit a biography—although I always am trying to acquire more merit. From a practical point of view, if you succeed in getting a biography of me published and it is not a hatchet job, it should be helpful. Although you might be subject to pressure from your publisher to produce a book fitting a certain stereotype of me and my message. Anyway, it is a project that I am willing to discuss with you. I wrote back to Pierce that I wasn’t planning on writing a full-scale, detailed biography, bringing in multiple sources and perspectives and all. Rather, I was thinking of something akin to what goes on between a subject posing for a portrait and an artist. That is to say, the book would essentially be about him and me: the way he presents himself to me and the way I make sense of and render that presentation. I said I wanted to hear him talk about his life growing up and what he has done as an adult. I wanted to learn about the circumstances in society and the people and experiences and ideas that have had an impact on him. I wanted to become familiar with the books that have made a difference to him—I’ d like to read them if I haven’t—and see if I can learn why they affected him as they did. I wanted to look at how his public life and private life have affected one another. I wanted to do those things in order to paint a picture of him, so to speak. So a portrait would be a more accurate way of referring to what I had in mind than a biography. And, really, I said in the letter, I am not setting out to do a hatchet job on you. I am not intending to write a judgmental book; rather, I want to be a vehicle that will allow readers the chance to get a good look at you and to decide for themselves what they see. I told Pierce I would stay away from slanting or channeling people’ s impression of him by tacking negative labels on him—neo-Nazi, anti-Semite, bigot, hater. However, he had to understand that after hearing what he has to say and reviewing what he has done with his life, readers may well decide that, indeed, those labels suit him. And as for publishers pushing me to fit him into a certain stereotype—he had mentioned that possibility—I told him that I was not going to bend reality for anybody. I told Pierce that I wanted to meet him in person—I hadn’t at that point—and talk more about this project and see if it seemed as if the two of us could work together. I said I thought a couple of hours with one another should give us a good sense of whether we ought to keep exploring this idea. Pierce said that was all right with him, and I went to see him in West Virginia. This was in the fall of 1997. We talked for two hours in the afternoon at his office in the National Alliance headquarters building on his three hundred forty-six acre plot of land. Basically, we got acquainted. He asked me about what things were like at the university where I am on the faculty, and we talked about university politics for a time. I thought the session went well. Pierce seemed open and unthreatened—I had expected more wariness, which would have been understandable—and he was congenial and expansive. At the end of that first meeting, we decided that I should come back and spend a full work day at the property. Explosion of Hate notes that other murderers and terrorists besides Timothy McVeigh appear to have been inspired by Pierce’s violence-filled writings and pronouncements. In the 1980s a gang calling itself the “Order,” after the elite paramilitary unit in The Turner Diaries, went on a crime spree which included bombing a synagogue, murdering a Jewish talk show host, counterfeiting, and robbing over four million dollars in an armored car heist. The Order’s leader, Robert Mathews, was a member of the National Alliance and recruiter for the Alliance who once spoke at one of the organization’s national conventions. Reportedly, Mathews told people that he was intent on being the catalyst for an uprising against the System like the one described in Pierce’s book. Mathews, who was killed by FBI agents in a shoot-out, has become a martyr and cult hero among right wing fringe elements and a model for others who would follow his lead. The ADL report cites the statement of then-publisher George Burdi in the skinhead-oriented magazine Resistance invoking Mathews’ memory in the course of singing the praises of the National Alliance. Said Burdi: “The National Alliance is clearly the most forward-looking and progressive racialist organization in the world today, and it is no wonder that Robert Mathews endorsed them so wholeheartedly.” Another example, authorities say a white supremacist group calling itself the Aryan Republican Army and led by a man called Peter Langan committed twenty-two bank robberies and bombings across Midwest between 1992 and 1996. Langan praised Robert Mathews and instructed his viewers to “learn from Bob.” Not surprisingly The Turner Diaries was required reading in the Aryan Republican Army. In March of 1998, Dennis McGiffin and two others were charged with conspiracy to possess and make machine guns. FBI agents testified that McGiffin and the others were influenced by The Turner Diaries. They planned to form a “New Order” and talked of, among other things, bombing state capitols and post offices and poisoning public water supplies with cyanide. In 1997, Todd Vanbiber, a National Alliance adherent in Winter Park, Florida, pleaded guilty to illegally constructing and possessing explosives and was sentenced to six-and-one-half years in prison. At a sentencing hearing in October 1997, a cellmate testified that Vanbiber admitted he planned to use the bombs against African Americans attending Fourth of July celebrations. A Federal complaint against Vanbiber alleged that he had met with William Pierce at his West Virginia compound for two hours and while there donated one thousand dollars to the National Alliance and purchased seven hundred dollars worth of its literature. In December 1995, a black couple was gunned down near Fort Bragg in North Carolina in what prosecutors called a racially motivated killing. James Burmeister and Malcolm Wright, members of the 82nd Airborne Division, were convicted of the murders and sentenced to life in prison. Burmeister and Wright reportedly read National Alliance propaganda. Prior to these events, the National Alliance had been attempting to attract members among U.S. Army personnel at Fort Bragg. One of its activitists, Robert Hunt, a soldier and recruiter for the Alliance, rented a billboard and used it to post an advertisement and local phone number for the organization. In April of 1996, Larry Wayne Shoemaker killed one African American and injured seven others in Jackson, Mississippi. According to his ex-wife, Shoemaker first encountered National Alliance propaganda in the mid-1980s, when he borrowed The Turner Diaries from a friend. She said her husband wasn’t the same after he read Pierce’s novel. “It was like an eye-opener for him,” his wife said. “There was a distinct difference in him.” Shoemaker soon began subscribing to Pierce’s monthly publications. In William Pierce’s novel, The Turner Diaries, the events that set off the anti-government terrorist acts of Earl Turner were a series of brutish government raids on gun owners following the passage of federal legislation outlawing the private ownership of firearms. Turner reacted to the raids by blowing up a federal building with a fuel-oil and fertilizer bomb concealed in a truck. Not only was the composition of the fictional bomb almost exactly the same as the one Timothy McVeigh constructed and detonated, it was also almost exactly the same weight. It seems very probable that McVeigh saw parallels between the government raid on the Branch Davidians in Waco to enforce anti-gun laws and the gun raids portrayed in The Turner Diaries, and that McVeigh responded to what he saw as the unwarranted and violent assaults on gun owners in Waco the same way that the protagonist in Pierce’s book, Earl Turner, had responded to the heavy-handed crackdowns on gun owners by agents of the fictional federal government. Anti-Defamation League [Note of the Ed. : A Jewish hate group] sources have reported that just days before the bombing, McVeigh mailed an envelope to his sister in Florida containing copies of the cover and selected pages from The Turner Diaries. He included a note that said she should be sure to read the back cover. On the back cover of The Turner Diaries at the top in bold black letters is the question, “What will you do when they come to take your guns?” And then the answer: “The patriots fight back with a campaign of sabotage and terror.” When McVeigh’s sister learned of her brother’s arrest in connection with the bombing, she burned the contents of the envelope. Incidentally, McVeigh’s accomplice in the bombing, Terry Nichols, also may have been influenced by the writings of William Pierce. Federal agents found a copy of another of Pierce’s novels, Hunter, in Nichols’ home. They saw few other books in the house. Hunter, written in the late 1980s, is Pierce’s follow-up to The Turner Diaries. It recounts the exploits of Oscar Yeager, who tries to “cleanse” America by killing first interracial couples and then Jews. In the weeks immediately preceding the bombing, McVeigh stayed at the Imperial Hotel off Route 66 near Kingman, Arizona. Several sources have reported that between April 5th and April 11th McVeigh made seven calls to a message center operated by a radical right-wing organization called the National Alliance. The chairman of the National Alliance is William Pierce. Two of the seven calls allegedly were patched through to Pierce’s unlisted number in West Virginia where he is headquartered. The Turner Diaries was the very first piece of evidence introduced by the prosecution at McVeigh’ s trial in Denver. During the trial, several of McVeigh’s friends told the court that he had mailed them copies of the book along with a note encouraging them to read it. One of them, Kyle Kraus, a buddy from McVeigh’ s army days, testified that when he learned of the Oklahoma City bombing, he was immediately reminded of scenes from the book and grabbed the copy McVeigh had sent him and took it to the local FBI office. McVeigh’s first contact with The Turner Diaries came when he was in the army and ran across an advertisement for the book in the mail order section of the survivalist magazine, Soldier of Fortune. McVeigh ordered the book and according to those around him at the time awaited its arrival with eager anticipation. When the book finally arrived, McVeigh became obsessed with it, reports his roommate William Dilly. “He took it into the field and read it for three weeks straight,” Dilly said. “He said it was really wild and tried to get me to read it.” Another friend of McVeigh’s, Brandon Sticky, said that McVeigh read and re-read the book and was known for constantly carrying his well-thumbed copy of the small paperback around with him in his pocket. Apparently The Turner Diaries altered the course of Tim McVeigh’s life as well as the lives of thousands of people in Oklahoma City. And to the extent that the Oklahoma City bombing is a memorable event—and even, in ways that are not clear to us now, a significant event—William Pierce’s self-published novel has become part of the history of America. It was a little after 7:00 p.m. on one of the pleasant summer evenings I had come to expect in the mountains of West Virginia. I was waiting for William Pierce in his cluttered, book-lined office in the National Alliance headquarters building. I had been living in this remote area on Pierce’s property for over two weeks at that point. When I had come to his office a couple of minutes before, I was surprised to find that Pierce wasn’t there. We were well into a series of interviews I was conducting with him in the evenings, and he’d always been here when I arrived. I assumed that something had held him up and that he would be along in a minute or two. I set up my tape recorder and went over the notes I had put together about the areas I wanted to explore during that night’s session. I had just finished going through my notes when out of the corner of my eye I saw someone come in through the door to the left of where I was seated. It wasn’t Pierce but rather his new wife, with Pierce right behind her. That surprised me; always before, Pierce had been alone. “Bob, could you and I talk after you talk with Bill?” Pierce’ s wife said in her halting, heavily-accented English and in her polite and gentle way. She had come from Eastern Europe to West Virginia less than a year before. She and Pierce had not met before she came, and after she was here only a month they married. Pierce’s wife is an attractive woman of about fifty I would guess, with auburn hair and very fair skin. She had taught art to children in her native country. I was taken by her calling him “Bill.” She was the only one who lived or worked on the property who did. To everyone else, including me, he was Dr. Pierce. She seemed on edge about something. She was usually smiling and upbeat, but not now. With that, Pierce’s wife sat down on the nearest of a row of chairs that face Pierce’s desk. I was seated a couple of chairs away from the one she sat on. Pierce went around his desk and took a seat behind it. There we were, the three of us. It was silent for a moment. There was tension in the air, but I had no idea what it was about. Pierce’s wife turned and faced me. “I have something to ask of you,” she said. She seemed shaken. “Is there something wrong?” I asked. “You do look frightened,” I said. I didn’t know what to say, and up to that point Pierce hadn’t said anything. I said I didn’ t want to see her afraid like this, and that I would use some other name for her, and that I wouldn’t say what country she was from or use her picture. At this point, still seated, she dipped her hand into her pants pocket and pulled out a pistol. I jumped. “I carry this everywhere I go,” she said as she held the gun neck high in her right hand to display it to me. I was speechless and stared at the gun. “Don’t be waving that gun around, it’s loaded!” Pierce barked. As a matter of fact, Pierce had a holstered weapon strapped to his waist at that very moment—I’d gotten used to that. I reiterated that I would protect her identity. So I will call Pierce’s wife Irena in the book. It is the only name I have changed. The phrase is cut, but can be completed with another of Ecce homo in which he says: Why should not I continue to live in him and he in me after his untimely death? And he was no less mystical in his later years, when he conceived the doctrine of eternal recurrence, so he could skip the generational order to become a descendant of Napoleon, Caesar or Alexander. But the same process also allowed otherwise: the mysterious identification with the father, either in the agonizing fear of premature death and madness, either in the gut, not even confessed to his friend Gast, that having survived the fateful thirty-third year of his life he would merge with his father to form a single figure with him. The family was assured that Fritz (short for Friedrich) would be clergyman as the father. His mother, who was not limited to accompany him to the bed but every night carried him into it, panting said, “If you continue like this I’ll have to carry you up to bed until you study theology.” Fritz, meanwhile, was a precocious and obedient child; knew by heart passages of the Bible and religious songs so that their local school classmates called him the little shepherd. He was no friend of other children, and in school they laughed at him but then, at home, spoke wonders of the little sage. Young Nietzsche, whose strange factions made one think of an owl, had an excellent performance. An anecdote belonging to the repertoire of Elisabeth [Nietzsche’s sister] tells us that, at one point, it started raining and as everyone ran from school to their homes, he continued to walk at a leisurely pace with the board over his hat and scarf on the blackboard. When Nietzsche got home was completely soaked. That why he had not run like the others? Well, because the school regulations say that, after school, children should go to their houses quietly and politely. The story seems credible; it was not normal behavior, but a show of obedience directed against his classmates’ behavior. The little shepherd never tires of reciting pious maxims, edifying virtuous desires and prayers. Words like purpose, wise decision of God, beneficent hand of God, heavenly father come out of his lips with astonishing naturalness. The strongest impressions were those that religious music gave Nietzsche. In the misty autumn evenings, the boy came sneaking into the cathedral to witness the rehearsals of the Requiem for the day of the dead; he was overwhelmed to hear the Dies irae and was deeply delighted with the Benedictus. It was not just a childish impulse that led him at fourteen, in Schulpforta, to write in all seriousness motets, chorale melodies and fugues and even try a Missa for solo, chorus and orchestra. At sixteen Nietzsche outlined a Miserere for five voices and, finally, began a Christmas oratory on which he worked for two years. At seventeen, the son of the pastor received confirmation. His classmate Deussen, also a son of pastor says the two maintained a pious attitude, away from the world. They were willing to die immediately to go to meet Jesus. When his friend Wilhelm Pinder received confirmation, Nietzsche wrote: “With the promise you walk into the line of Christian adults who are considered worthy of the most precious legacy of our Savior, and through their enjoyment of life, achieve happiness of the soul.” Not even from the pastor’s pen would have come such pious words. In High School Nietzsche had an “excellent” in religion. The commentary reports confirm that the student has shown, along with a good understanding of the New Testament, a keen interest in the doctrine of Christian salvation which he has easily and solidly assimilated, and is also able to express himself clearly on the subject. Nietzsche’s biography ends in the early days of 1889, although his life was extended until August 25, 1900. Paralyzed and demented, he died of pneumonia. On August 10, 1889 Nietzsche entered the psychiatric clinic of the University of Basel; a week later he is taken to the Jena University Clinic where he remains for about fifteen months, and on March 24, 1890 he is discharged in writing and sent home. Nietzsche remains under the care of his mother until her death in 1897. In July 1897 the sister purchases a Weimar villa, “Silberblick,” for the Nietzsche Archive and in it she installs the patient. About the demented Nietzsche several persons issued reports: (1) Turin dentist, Dr. Bettmann, who with Overbeck brought Nietzsche to Basel; (2) the diaries of Basel and Jena for the sick by the physician (and later professor) Ziehen; (2) the mother in his letters to Professor Overbeck, and (4) friends and visitors, from Gast to Deussen and from Overbeck to Resa von Schirnhofer. The extracts that follow from 1889-1892 show on one hand the state of the disorder, but on the other they shed light on the “healthy” Nietzsche, specifically those oppressed and repressed aspects that madness liberated. The patient is usually excited, he asks much food but is unable to do something and take care of himself. He claims to be a famous man, and constantly asks a woman for him. He only answers partially and incompletely or not at all to the questions addressed to him, insisting in his confused verbiage nonstop. The patient walks on the department with many bows of courtesy. With majestic step, staring at the ceiling, enters the room and gives thanks for the “great reception.” He doesn’t know where he is. At night we always have to isolate him. He often smears himself with excrement. He eats excrements. He urinates in his boot or glass and drinks the urine or smears himself with it. Once he smeared a leg with excrement. He wraps excrements in paper and puts it all in the drawer of a table. He plays a little of music every day, partly his small compositions or songs of an old book of songs… The religious sentiment is asserted more and more in him. During Pentecost, when we were sitting quietly in the balcony with me holding an old Bible [he says] that in Turin he had studied the whole Bible and taken thousands of notes, when I read this or that psalm; this or that chapter, I expressed surprise that he knew the Bible so thoroughly. From 1892 Nietzsche can no longer feed himself. He has to be washed and dressed. The walks have to be abandoned because Nietzsche shouts and hits everything on his way. In 1894 Nietzsche recognizes Deussen, but in 1895 he no longer recognizes Overbeck. In madness it clearly appears a regression to infantile and juvenile stages. In the time of megalomania Dionysus and Zarathustra are totally excluded. Instead it reappears Frederick William IV [discussed in Ross’ earlier chapters], and Nietzsche says to his mother he is twenty-two. The last letter to Jacob Burckhardt is written by a “student.” His fears (the light should remain lit at night, the door must be closed) belong to an early childhood stage, like the “magic of the pieces of glass.” It is also noteworthy the return to the old religion and a fearful, even radical avoidance of everything philosophical. As a sick man Nietzsche is an obedient or uninhibited child. At the end he completely sinks into apathy. The mother, fearful, “limited” (as seen in the Basel clinic) was at first mean, although she continued to receive Nietzsche’s pension. But when he was with her she cared for him, protected and looked after him with motherly love. Friedrich then again became what in her opinion should have always been: her little child. On Sunday January 6, 1889 Jacob Burckhardt received a long letter from Nietzsche. While it is true that, from the Genealogy [On the Genealogy of Morals] at least Burckhardt had not followed Nietzsche’s philosophical way, he did continue to be humanely united to his former colleague. For long Burckhardt had watched with concern his state and inquired about it, but this turn towards mental disturbance surprised and deeply affected him. Burckhardt did immediately what was in his hand: he went immediately with the letter to see Franz Overbeck, whose close contact with Nietzsche he knew. Although their houses were not far apart—from the suburb of St. Alban to the Sevogelstrasse there are only a few hundred meters—, Burckhardt had never felt moved to walk that way. But now, the terrible impression he received prompted him to overcome that barrier. Also for Overbeck it was an alarming surprise to see Jacob Burckhardt into his home. Following a review of the two letters to Burckhardt and Overbeck, Wille [Prof. Dr. Ludwig Wille, a psychiatrist] had no doubt about how he had to try the case and what they had to do. He urged Overbeck that, without loss of time, to bring the friend from Turin to Basel, before he disappeared in any one of the dubious Italian centers. Overbeck immediately followed the advice, which seemed more like an order. By doing so he had to weight two considerations: firstly the question of costs. Neither he nor Nietzsche were doing well economically. Professorial fees were then rather scarce. And besides, surely it was not easy to a conscientious teacher to leave without official dispensation for a few days. In spite of everything, in the night of January 7 he parted to Turin, where he arrived the next day around 2 pm. Given his perennially poor health, the feat demanded a great effort from Overbeck, especially in the middle of winter. 18 hours in those times when trains, insufficiently heated or not heated at all during the night (no sleeper), meant a real sacrifice. But the worst still awaited him. It happened in the last time when it was still possible to get him without official impediments, except his own state. I pass over the moving circumstances in which I found Nietzsche as a pupil of his landlords; which seem to be also characteristic of Italy in general. With the terrible moment as I saw Nietzsche I come again to the principal issue: a terrible moment like no other, and totally different from everything that happened afterwards. 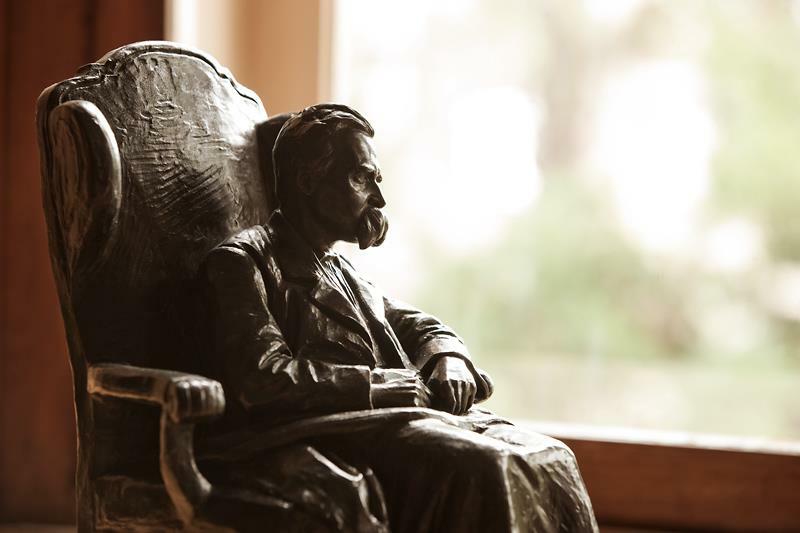 I see Nietzsche in a corner of the armchair, curled up and reading—as it was apparent later, the latest proofs of Nietzsche contra Wagner—, tremendously deteriorated in external appearance. He sees me and rushes towards me, recognizing me he hugs me tightly, and becomes a sea of tears. He goes back then, in convulsions, to sink himself into the armchair. Neither do I find strength, because of the shock, to pull myself on my legs. Did it open at that moment the abyss in which he finds himself, or better, into which he has fallen? In any case, no such thing has been repeated. All of the Fino family was present. Just as Nietzsche returned to rest there, moaning and with convulsive contractions, the watered bromide that was on the table was given to him. Instantly he relaxed, and, laughing, began to talk about the great reception that was prepared for him at night. Thus Nietzsche moved in a circle of delusions from which he never came out after I lost sight of him; being always clear of mind about me in general and other people, but caught in a full night about him. It happened that, exalting himself without measure, and with strong songs and frenzies on piano, shreds of the ideas were recovered from the world in which he had lived lately. Then, in short sentences, uttered in a tone indescribably flat, he had us hearing sublime, wonderfully visionary things and unspeakably terrible about himself as the successor of the dead God, tapping all, so to speak, at the piano. Afterwards the convulsions and fits of indescribable suffering returned. But, as said, this only happened in rare and fleeting moments. While I was present, generally the profession statements that he awarded himself dominated: to be the jester of the new eternities, and he, the incomparable master of expression, was unable to represent the enthusiasm even from his joy otherwise than through the most trivial expressions or by a ridiculous dancing and jumping. He then wrote to Peter Gast [Heinrich Köselitz] everything that happened in Turin during the terrible encounter; his hand refused to transcribe to paper the latest and most sordid details. Although occasionally he alluded to this in the most intimate circles, and to me personally he completed by word the description. In Turin he met a Jewish man who volunteered as a caregiver of the crazy (but he was not) and that with the help of his intervention they carried out the risky venture. Nietzsche was in bed and refused to get up. The Jew told him that they were prepared for large receptions and festivities, and Nietzsche got up, dressed and went to the station with them. There he wanted to embrace all people, but the companion explained him how it was not appropriate for such an important man: and Nietzsche calmed down. Using large quantities of sleeping pills the patient remained quiet during the trip, and thus came the three happily to Basel. The Turin police was already aware, and only a true kidnapping could prevent a forced entry into a center of that place. Then, miraculously, a stranger, a German Jew, apparently offered himself [for a fee] to transport the sick. Overbeck agreed and did not repent of his acceptance. With surprising touch the stranger immediately got influence on the wayward sick, something that the friend was not able to. The trick worked better than expected. The morning of January 10, 1889, around 8, Nietzsche and his caretakers arrived to Basel. A ready-cab took them to “Friedmatt” where the patient could be entrusted to the care of specialists. With that Nietzsche stopped being a person acting autonomously. The two-volume work of Heidegger on Nietzsche begins with the lapidary phrase: “Nietzsche, the thinking man testifies to the content of his thought.” But in the following hundreds of pages he does not appear, only his philosophical activity. Nietzsche had the misfortune to go down to posterity as a philosopher whereas he would have liked to do it as an apostle or officer of artillery; a lyric poet or composer; a revolutionary or reformer; ultimately, as a buffoon or a god. Nietzsche argued against the claims of truthfulness of all doctrines, including his. He ardently sought for results: a reversal of all relations, the abolition of Christianity, the beginning of a new era. His aspiration was to divide the history of humanity with a single stroke into two halves. Instead, it has been classified with others; and in college textbooks his name appears next to Leibniz and Kant. At the height of his self-consciousness, of his “delusions of grandeur,” Nietzsche came to think that the mere dissemination of his doctrine would cause the disintegration of the tablets of the law and of our civilization as the trumpets of the Israelites had caused the collapse of the walls of Jericho. But the earth did not shake nor the sun darkened when, in early January 1889, he went crazy. Obviously, great works take time. Nietzsche indeed contributed to the destruction of something that, at the time, many wanted ardently: “the fundamental values.” He was convinced that his ideas were dynamite, but all blasting is, ultimately, a child’s play compared to the persistent action of erosion. And if no revolution took place after Nietzsche, at least he caused a radical change in the general climate. In the circle of collaborators responsible for the historical-critical edition of his complete works, whose first volume appeared in 1934, the project finally came to publish a full biography of Nietzsche. This was undertaken by Richard Blunck during the Second World War. The owner of the Archive [Nietzsche’s sister] had died in 1935; Hitler had already visited her before and had brought with him as a gift Nietzsche’s swab. Blunck was unlucky: the whole edition of the first [biographical] volume, which was printed in early 1945, was destroyed during air raids. The volume did not appear until 1953. Blunck died in 1962, when he was working in the other volumes. Curt Paul Janz, a professional orchestra musician that had received a solid philological training at Basel, continued the work of Blunck. The result was the three-volume biography published in 1978-1979 by Hanser Verlag. This is a thorough study that collects all the facts and circumstances of the life of Nietzsche. My work has a lot to thank him. In the last months before the disaster, acute disturbances of the understanding of reality and his identity increasingly piled up. A fact whose significance cannot be underestimated is that Nietzsche’s philosophical thought is definitely interrupted with the Antichrist on September 30, 1888. In a completely wrong assessment of the magnitude and significance of the matter, Nietzsche wants to see from that date a new beginning, a new measure of time, and what happens is the beginning, just for him, of a “new” time, a new and radically different consciousness. What is perhaps the most significant part of his philosophy, the critique of knowledge, seems totally forgotten. Nietzsche no longer speaks of moral and cultural criticism; there are only vague memories of the world of Zarathustra (lyrical content is precisely what revives in some poetry). On the contrary, neither the “overman” or the “eternal return” are any longer defended. With the alleged murder of Pauline Christianity as inverted Platonism and as a building for Jewish priestly power, Nietzsche believes he has finished the major philosophical work. Everything else, all “revaluation of all values” naturally follows that, so that he is no longer committed but to ensure the propagation of this final “knowledge.” With it, on September 30, 1888 philosophy is finished! The first glance I threw inside surprised me: I discovered a long prologue… whose existence I had forgotten… Actually I kept in memory only the title of the three treaties: the rest, the content, was lost. This is the result of extreme intellectual activity… which, as it were, had brought a wall in the middle… Those times I underwent an almost uninterrupted state of inspiration, so that this text emerged as the most natural thing in the world… The style is passionate and disturbing, full of finesses: flexible and colorful as I had not written such prose before. A few days ago I leafed thru my writing, for which only now I am mature… I’ve done everything very well, but I had never thought of it… Damn, how much is hidden in there! —In the Ecce homo you will find a discovery on the third and fourth Untimely Meditations that will put you on the willies, as it did to me. Both speak only about me, anticipating… Neither Wagner nor Schopenhauer appear there psychologically… I could only understand these writings four days ago. Thus start the mystifying pseudonyms. For example, in the December 18 letter to Fuchs he is “the monster,” and after the collapse the pseudonyms take full possession of him. After philosophy, what Nietzsche first lost is his identity. Just two weeks later, on December 31, 1888 (to Köselitz) he does not already know his address: “Suppose it could be in principle the Palazzo del Quirinale.” Turin, from which emerged the young Italian kingdom, and Rome, from where it dominates now, merge into one before that blotchy look.